This a relatively recent studio singer-songwriter album (2007), full of poetic, spellbinding, mystical love-ballads. There are seven new compositions, four traditional songs and a cover version of the beautiful 'The first time ever I saw your face'. Every track is plaintive, deeply moving and sensitively produced, and 'Bow down' and 'Tomorrow's God' have quickly become universally acclaimed. The feel is acoustic, but... as with so much of Asher's music... it is really hard to define a genre. Is it pop? Is it folk? Is it new-age? Really these songs are unique, and simply not like anything one might hear anywhere else! 'Song of eternity', for example, is a lullaby, but one that seems to come from another dimension entirely. Much of East of East has an 'other-worldly' quality. New Age balladeer Asher Quinn has released another collection of a dozen songs, each one dabbling in some form of spiritual mysticism and all neatly wrapped around his whispery intimate voice. Quinn’s folk delivery enveloped in tasteful acoustic guitar and keyboards is a trip with Donovan into the Milky Way. 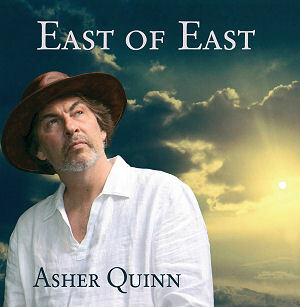 With influences ranging from Christianity, Judaism and Eastern religions to American folk rock, Quinn delivers an eclectic compilation on East of East. In the opener 'Bow Down', Quinn captures the listeners’ attention with his quick acoustic guitar picking joined by the subtle mouth organ. The quiet keyboard sustained in the chorus adds dramatic emphasis to the layered vocals. Quinn does a phenomenal job of layering his tracks to create atmosphere. The instrumentation in the ballad 'Song of Eternity' is lovely, as is 'You Give Me Strength' with its top notch string sounds. In the bonus track, 'Lord of the Trance', a circular musical motion is created by the swirling falsetto vocals, guitars and keyboards. On East of East Quinn offers his take on four unoriginal works. 'The First Time Ever I Saw Your Face' was originally written for the folk artist Peggy Seeger in the late ‘50s. It was not until the early ‘70s that R&B crooner Roberta Flack sang it at half speed that the McColl tune became known as a romantic ballad. It has since been covered mostly by women ranging from Celine Dion to Leona Lewis. Quinn, however, was inspired by a Johnny Cash cover. To properly pay homage and capture that same raw energy, Quinn deftly adds a hint of vibrato into the lower notes of this timeless love song. A live version of 'Lily of the West' also adorns East of East. This traditional country-western ditty with its sense of urgency and dire ending could easily have been a Cash number. Ironically it was covered by his daughter Roseanne; however Quinn was moved by the Bob Dylan rendition of this song about love and betrayal. On a more traditional note, Quinn sings a quick minimalist version of the slave spiritual 'Sometimes I Feel Like a Motherless Child' with light piano accompaniment and distant throbbing percussion. He utilizes good call and response technique with the echoing voice pleading in desperation. Quinn also adds his own musical arrangement to Horatius Bonar’s traditional Protestant hymn 'I Heard the Voice of Jesus Say'. For those in search of deeper poetic license, the title track and 'By the Look In Your Eyes' offer a deluge of interdimensional spiritual concepts. The latter is a mysterious number that opens with the sounds of the wind blowing and hauntingly expounds upon the relationship between a man and a muse. 'East of East' is a series of conceptual notions of where we go when we die. East of East is arguably one of those albums that can pit the lyrical listeners versus the instrumental listeners, kind of like early Yes and Genesis fans. Both aspects of the album can brilliantly stand alone, but the connoisseurs who can enjoy the entire package are truly garnered a moving experience. I have to say the first time I was very moved by 'Tomorrow's God', it brought a tear to the eye and I can't tell you why. Your music is wonderful and your voice so soothing. 'Song of eternity' is my favorite so far. Do you ever get to the USA? Your new album is wonderful. I really loved it a lot. I really enjoyed the CD so much. The best so far, I think. Some of the songs are very moving with wonderful words. I have a friend who was in the band Lindisfarne, and he really enjoyed it too. You are a guiding light through this fragile world. I hope my children will understand your words - compassion, hope, sadness - our broken hearts finally found their medicine in your music.